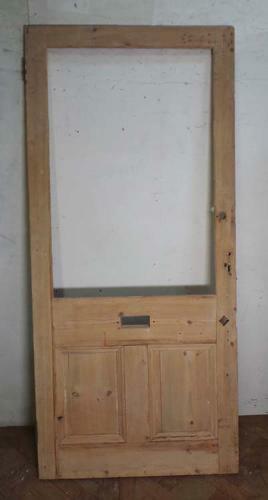 This original sturdy and beautifully made Victorian pine panelled door is fully morticed and tenoned. The door is constructed with a gun stop chamfer, and comprises of one large panel for glazing over two solid panels, flush-fitted to the front with decorative mouldings to the rear. The door is in excellent condition, and is fully stripped ready for painting. The door will need to be glazed with glass that conforms to current safety standards. Please contact us to discuss options.